people KRISTEN BARNARD NYC-based VFX studio Light of Day has hired Kristen Barnard as head of production. With 12 years of experience as an agency pro- ducer, she will work with Light of Day's clients in the feature film, music video, Web and spot world. 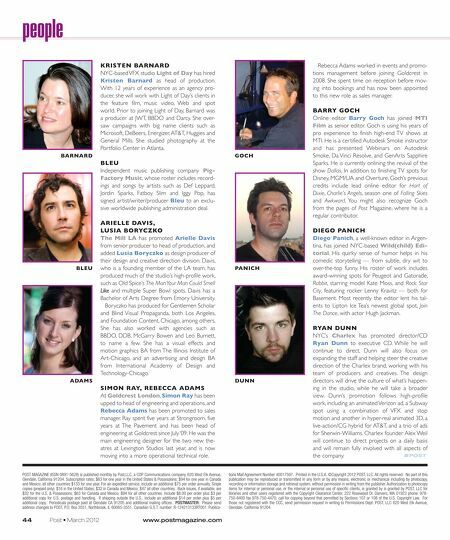 Prior to joining Light of Day, Barnard was a producer at JWT, BBDO and Darcy. She over- saw campaigns with big name clients such as Microsoft, DeBeers, Energizer, AT&T, Huggies and General Mills. She studied photography at the Portfolio Center in Atlanta. BARNARD BLEU Independent music publishing company Pig- Factory Music, whose roster includes record- ings and songs by artists such as Def Leppard, Jordin Sparks, Fatboy Slim and Iggy Pop, has signed artist/writer/producer Bleu to an exclu- sive worldwide publishing administration deal. BLEU ARIELLE DAVIS, LUSIA BORYCZKO The Mill LA has promoted Arielle Davis from senior producer to head of production, and added Lusia Boryczko as design producer of their design and creative direction division. Davis, who is a founding member of the LA team, has produced much of the studio's high-profile work, such as Old Spice's The Man Your Man Could Smell Like and multiple Super Bowl spots. Davis has a Bachelor of Arts Degree from Emory University. Boryczko has produced for Gentlemen Scholar and Blind Visual Propaganda, both Los Angeles, and Foundation Content, Chicago, among others. She has also worked with agencies such as BBDO, DDB, McGarry Bowen and Leo Burnett, to name a few. She has a visual effects and motion graphics BA from The Illinois Institute of Art-Chicago, and an advertising and design BA from International Academy of Design and Technology-Chicago. ADAMS SIMON RAY, REBECCA ADAMS At Goldcrest London, Simon Ray has been upped to head of engineering and operations, and Rebecca Adams has been promoted to sales manager. Ray spent five years at Strongroom, five years at The Pavement and has been head of engineering at Goldcrest since July '09. He was the main engineering designer for the two new the- atres at Lexington Studios last year, and is now moving into a more operational technical role. 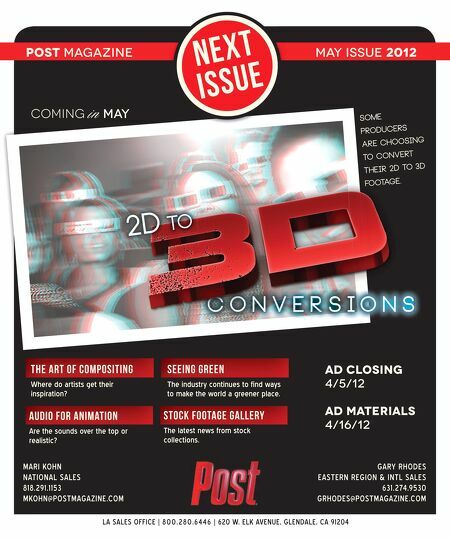 POST MAGAZINE (ISSN 0891-5628) is published monthly by Post,LLC, a COP Communications company, 620 West Elk Avenue, Glendale, California 91204. Subscription rates: $63 for one year in the United States & Possessions; $94 for one year in Canada and Mexico; all other countries $133 for one year. For air-expedited service, include an additional $75 per order annually. Single copies (prepaid only): $16 in the United States; $32 in Canada and Mexico; $47 all other countries. Back issues, if available, are $32 for the U.S. & Possessions; $63 for Canada and Mexico; $94 for all other countries. Include $8.00 per order plus $3 per additional copy for U.S. postage and handling. If shipping outside the U.S., include an additional $14 per order plus $5 per additional copy. Periodicals postage paid at Glendale CA 91205 and additional mailing offices. POSTMASTER: Please send address changes to POST, P.O. Box 3551, Northbrook, IL 60065-3551. Canadian G.S.T. number: R-124213133RT001. Publica- 44 Post • March 2012 www.postmagazine.com GOCH Rebecca Adams worked in events and promo- tions management before joining Goldcrest in 2008. She spent time on reception before mov- ing into bookings and has now been appointed to this new role as sales manager. BARRY GOCH Online editor Barry Goch has joined MTI Film as senior editor. Goch is using his years of pro experience to finish high-end TV shows at MTI. He is a certified Autodesk Smoke instructor and has presented Webinars on Autodesk Smoke, Da Vinci Resolve, and GenArts Sapphire Sparks. He is currently onlining the revival of the show Dallas. In addition to finishing TV spots for Disney, MGM/UA and Overture, Goch's previous credits include lead online editor for Hart of Dixie, Charlie's Angels, season one of Falling Skies and Awkward. You might also recognize Goch from the pages of Post Magazine, where he is a regular contributor. PANICH DIEGO PANICH Diego Panich, a well-known editor in Argen- tina, has joined NYC-based Wild(child) Edi- torial. His quirky sense of humor helps in his comedic storytelling — from subtle, dry wit to over-the-top funny. His roster of work includes award-winning spots for Peugeot and Gatorade, Rabbit, starring model Kate Moss, and Rock Star City, featuring rocker Lenny Kravitz — both for Basement. Most recently the editor lent his tal- ents to Lipton Ice Tea's newest global spot, Join The Dance, with actor Hugh Jackman. DUNN RYAN DUNN NYC's Charlex has promoted director/CD Ryan Dunn to executive CD. While he will continue to direct, Dunn will also focus on expanding the staff and helping steer the creative direction of the Charlex brand, working with his team of producers and creatives. The design directors will drive the culture of what's happen- ing in the studio, while he will take a broader view. Dunn's promotion follows high-profile work, including an animated Verizon ad, a Subway spot using a combination of VFX and stop motion and another in hyper-real animated 3D, a live-action/CG hybrid for AT&T, and a trio of ads for Sherwin-Williams. Charlex founder Alex Weil will continue to direct projects on a daily basis and will remain fully involved with all aspects of the company. tions Mail Agreement Number 40017597. Printed in the U.S.A. ©Copyright 2012 POST, LLC. All rights reserved. No part of this publication may be reproduced or transmitted in any form or by any means, electronic or mechanical including by photocopy, recording or information storage and retrieval system, without permission in writing from the publisher. Authorization to photocopy items for internal or personal use, or the internal or personal use of specific clients, is granted by is granted by POST, LLC for libraries and other users registered with the Copyright Clearance Center, 222 Rosewood Dr. Danvers, MA 01923 phone: 978- 750-8400 fax 978-750-4470; call for copying beyond that permitted by Sections 107 or 108 of the U.S. Copyright Law. For those not registered with the CCC, send permission request in writing to Permissions Dept. POST, LLC 620 West Elk Avenue, Glendale, California 91204.